^ Dutton 2007, p. 22. ^ 西沢正和・監修 2010, p. 37. ^ 松本 2005, p. 23. ^ 技能士の友編集部・編著 2002, p. 80. Dutton, Thomas (2007) (英語). The Hand Tool Manual. TSTC Publishing. 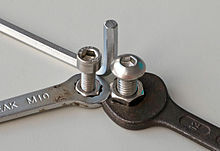 OCLC 717384791.
Who invented the Allen Key?